That was one of the gutsiest games I’ve ever seen the Army Brotherhood play. An unbelievable effort by the Black Knights who showed the world (albeit through twitter and twitch pirate streams) what Army Football is all about. I really can’t express how proud I am of these guys. They went toe-to-toe against the best in the nation without fear. ✅Possess the Ball for over 40:00 Minutes – Absolutely phenomenal job by the offense for sustaining LONG drives. OU defense did not prepare for that! ❌Score 35 Points – We didn’t accomplish this but since we did such a good job on key #2, all we needed in regulation was 24. If we could have scored on our final drive in regulation and left Kyler Murray with less than 30 seconds, I believe we leave Norman victorious. This is why the regulation turnover ultimately beat us. ✅Catch a Big Break – The interception off an uncharacteristic throw by Murray after the Black Knight offense went 3 and out in the third quarter meets the big break criteria. Our second big break was the 33 yard missed field goal. People compare football to life because it’s true. The game deals out adversity, whether it be through injuries, the opponent, the environment, or even the bounce of the ball. In the profession that you have selected, the enemy will also deal adversity. As future Army Officers, America is confident knowing that you will be leading her Sons and Daughters and protecting our interests domestic and abroad. Back to back awards for you! A huge 9-yard sack on 3rd and 10 to end the Sooners drive before the half. Then, another monumental play on 4th and Goal from the 1-yard line. You man-handled Trey Sermon and the lineman trying to push him in. Talk about firing me up! That was the best play I’ve seen all year…I will be seeing you on the top plays of 2018. You are without a doubt THE guy I want to be in a foxhole with. I got to know you briefly last summer during CTLT, but seeing you out their destroying people gives me chills! No need to walk anywhere this week! Make sure to share with Raymond Wright. He got the initial contact to slow down Sermon. Also, don’t forget Captain American (Cole Christiansen for those that didn’t read the Hawai’i Superlatives) who locked up those ankles! Where did you come from…The Lost Fifties…River Courts? I don’t know where you came from (actually it was the Sprint Team #poaching), but you came in and nailed 3/3 PATs. They looked HIGH and STRAIGHT. We will see how the rest of the year pans out, but we would like an extra season out of you since you have the eligibility. The Dean is currently working on this now. Remember that one time you managed to get hooks in on your oversized opponent in combatives and ended up controlling the bout in front of your classmates? Yes, it was cool. That is exactly what the Army Offense did to Oklahoma, except they did it front of 80,000 Sooner fans. The Army offense was the equivalent of the squirrely 125 pound kid in your combatives class who no one knew wanted to branch infantry until he’s choking you out with his thighs. Army possessed the ball 44:41, was four for five on fourth down, and only punted twice. When the offense didn’t have Oklahoma in a rear-naked choke, they reminded them they were still there with some well-placed knees to the ribcage. DPE still won’t count half of your push-ups during your firstie APFT, but enjoy the combatives class drop. Army’s Coaching Staff integrated pre-planned targets into their game plan, chiefly the knees of the Oklahoma players. The Sooners and company were scared by the effectiveness of Army’s ability to move low through holes, or knees (so much so that articles were written about it…Google it). 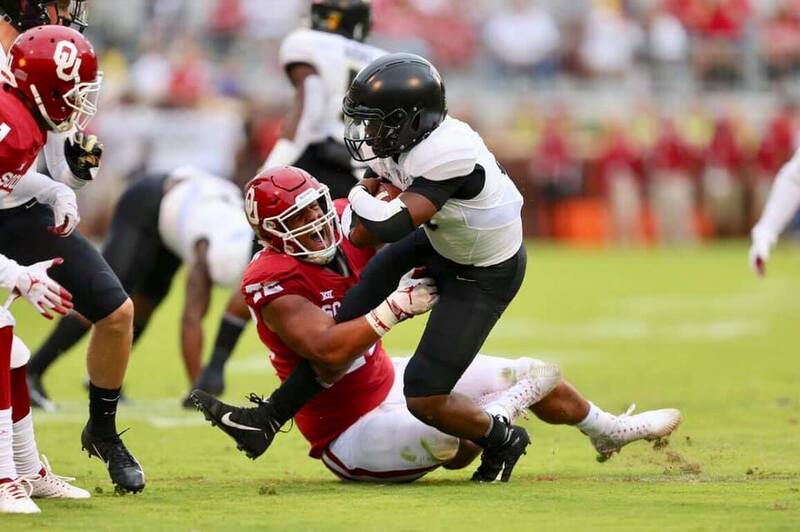 Not only did Army’s coaching staff have their targets, but also, they were keen to the enemy’s areas of interest, as seen when Mike Reynolds intercepted Kyler Murray like a well-trained a Stinger Team. Coach Monken has been contacted about the Air Defense Artillery’s new favorite branch prospect. The staff’s game plan and integration of primary, secondary, and tertiary targets created the best TTLODAC table in all of Buckner, earning them this COA. The officials may have missed it, but I didn’t. On 2nd and 10 with 1:46 left before the half, Kell Walker rushed for a loss of 2 yards. During that play your uncoordinated 6’5″ body hit the ground, rolled over, and then kicked an American Soldier out of bounds with the bottom of your cleat. It should have been 15 yards for unnecessary roughness, which they were quick to call on the Flyin Hawaiian. This would have extended our drive and put us in OU territory, likely resulting in points before the half. Are you serious? $54.99 Pay-Per-View to watch America’s Team. Sure…your marketing department created some nice pregame military videos and held field recognition during the game, but literally every team we play on the road holds a military appreciation night. We are not coming to be appreciated, we are coming to kick your fourth point of contact! And that is exactly what the OU athletics department needs after taking a service members entire monthly BAS to watch the game. Seems a lot like the West Point taxi drivers charging $10/cadet no matter how many cram into the minivan to get back from Garrison Train Station. For those that are wondering why the game wasn’t on mainstream TV read on…Each Big 12 member gets to hold back one game per season to distribute as it sees fit. OU has a contract with Fox Sports Net that created a quasi-Sooner network known as SoonerSports.tv. Through it they televise a bunch of basketball games, baseball games, and other sports. As part of the deal that earns the Sooners about $5 million per season, Fox controls the one football game per year on PPV through SoonerSports.tv. The Game that they should have held back was the Florida Atlantic blowout…Lane Kiffin also gets a $5,000 fine. It’s unknown if the greats of the Corps were gathered in ghostly assemblance in Norman on Saturday, but the shiver Austin Seibert got up his spine before shanking the 33 yard field goal attempt suggests they were. Coach Riley better send a trainer to check up on Seibert at least once a day because whatever Schwarzkopf, Patton, Blanchard, and Davis whispered in his ear prior to the kick shook him to his core. Consider reading this article about resiliency courtesy of the U.S. Army (hint: be the tennis ball). As a way to save your roommate from Simon and Garfunkel on repeat and a tear-soaked, sniveling mass of Green girl and kicker, you won’t be sleeping in anymore. That’s right, you’ll be up and dressed with your bed made and closet opened every day until practice time. While the Old Grads and Corps will continue to celebrate the “Almost-Upset,” the Army Team needs to move on. If you don’t, the Bulls will sneak up on you. I hate Buffalo, partly because it’s cold and nasty, partly because of #Buffalo2016. This is a Trap Game. They are 4-0 and arguably, the best team we play for the rest of the season. Don’t let the media write off the Oklahoma success because of a loss next week. Let’s win out and get into the Top 25! The Army Team came to play in Norman! I am extremely proud of the gut-check they gave those Sooners. As it stands, Army is .500 with 2 losses to Top 25 Teams (OU #6, Duke #22). 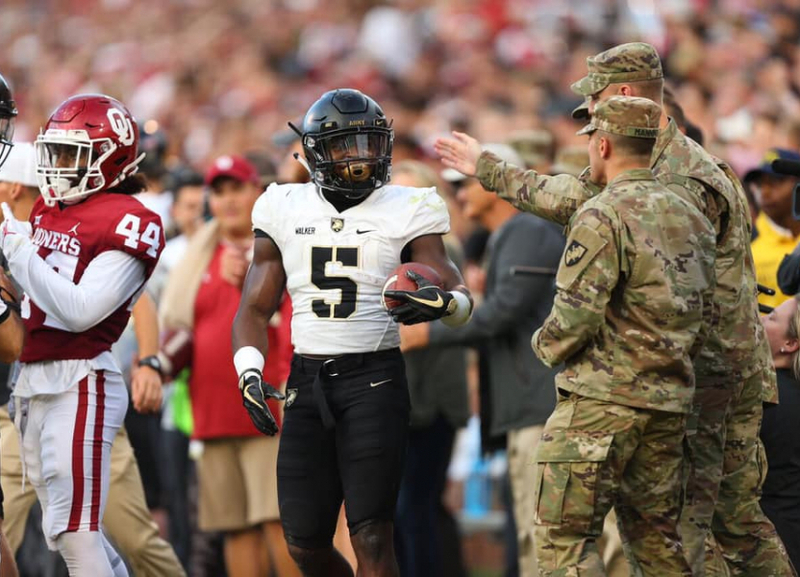 The effort on Saturday night (despite the ending) instilled confidence in the new culture Monken has brought to West Point. The Cadets whooped the Sooner defense across that field and made them wonder if it was worth it (just look at their eyes in the 4th quarter). I am excited to be an Army fan, not only because it was a great game but because Army proved to be a relevant threat to the best in College Football. The future is promising for the Black Knights but it starts with this upcoming Saturday. Keep grinding. We’re watching and we’re proud to be Army fans.